Oh My Dog! 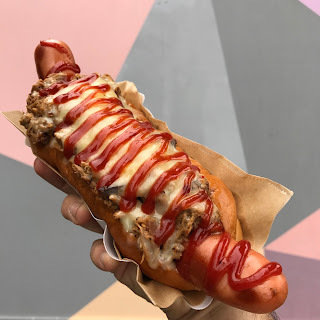 - purveyors of fine hotdogs and KERB and elsewhere - will be serving their 'dogs at The Old Nun's Head in Nunhead Green on Thursday and Friday evenings from 15th Feb to 16th March. (See the line-up on the other days here) Go to try their great 'dogs - including a new vegan range - plus sides and desserts. See you there! On Thursday the 15th February, Oh My Dog! is bringing the hottest dogs in London back to the Old Nuns Head for a 5-week popup, every Thursday & Friday. To celebrate, it will be offering a brand-new menu including its new vegan range (see below), a host of new sides & desserts and of course, everyone’s favourite dogs including the return of the incredible Chilli-Steak Dog & Deputy Dog. After months of R&D Oh My Dog! is launching its new vegan range. Expect a selection of vegan twists on its most popular dogs, featuring a delicious and unique smoked seitan sausage in a freshly baked vegan demi-brioche bun, topped with exciting toppings like braised bourbon jackfruit chilli, oozing with vegan cheese and sprinkled with diced jalapeños and vegan sour cream. Every Thursday is Quiz night & most Friday nights Comedy."